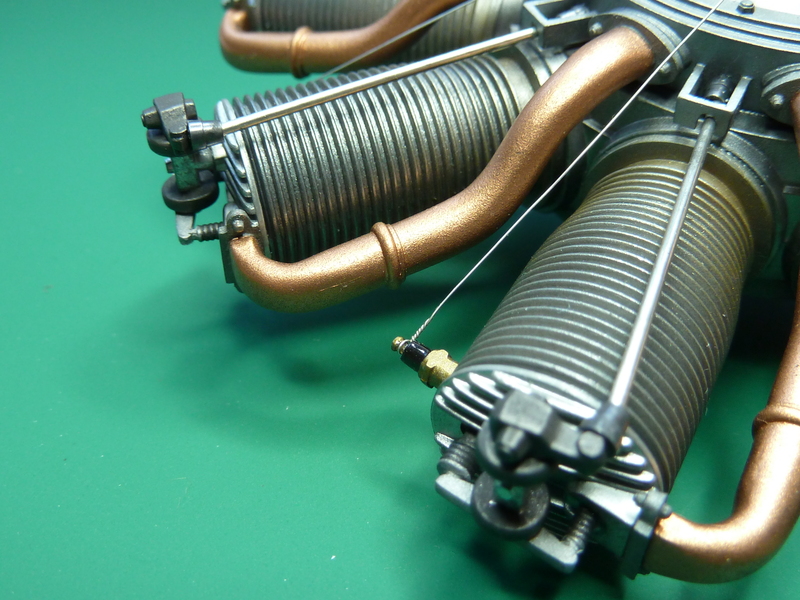 As with the Sopwith Camel Museum Series model the first component to be assembled is the engine. The Fokker Dr.1 had an Oberursel URII engine fitted as standard. The URII itself being a German clone of the French Le Rhone 9J engine. As a result of this some of the sprues included in the kit are actually labeled ‘Le Rhone’ and have obviously been taken from Hasegawa’s 1:8 model of that engine. 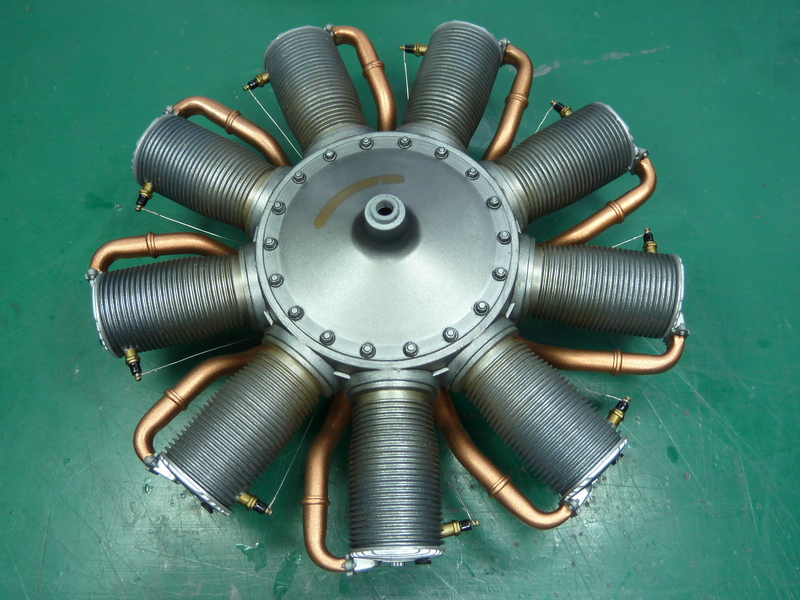 Assembly of the engine is a repeat of the Sopwith Camel’s Clerget engine. The cylinders are in two halves and with care, can be assembled with a virtually invisible join. All that was required was a quick run over with 1000 grit wet-and-dry paper to hide the seam. It’s a bit tedious doing between all the cooling fins though. The crankcase assembly is straight forward and follows the path of the real engine. I took my colour cues from a picture of the actual engine recovered from Richthofen’s aircraft, which is now on display in the Imperial War Museum in London. The crankcase and cylinders were painted a variety of metallic greys (I started with one colour and added small amounts of black to the mix as I airbrushed each part) and the cylinder heads a lighter aluminium colour. The whole assembly was then brushed over with graphite powder to give a metallic sheen and tie the parts together. 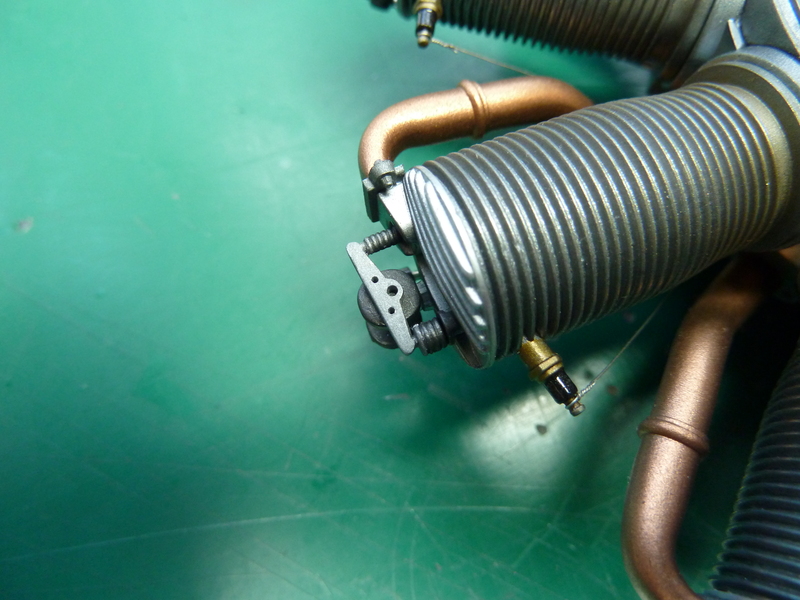 The lower parts of the cylinders were also dry brushed with an orange colour to hint at some heat staining. I’m not sure you can even tell there are different shades of the grey now. Ho hum…. I also sprayed on a small brass coloured patch to represent the Oberursel name plate, but it didn’t really work out properly and was later removed. I’ll redo it at some point, but I need to do it in conjunction with making a decal. The next components to be painted were the inlet manifolds. 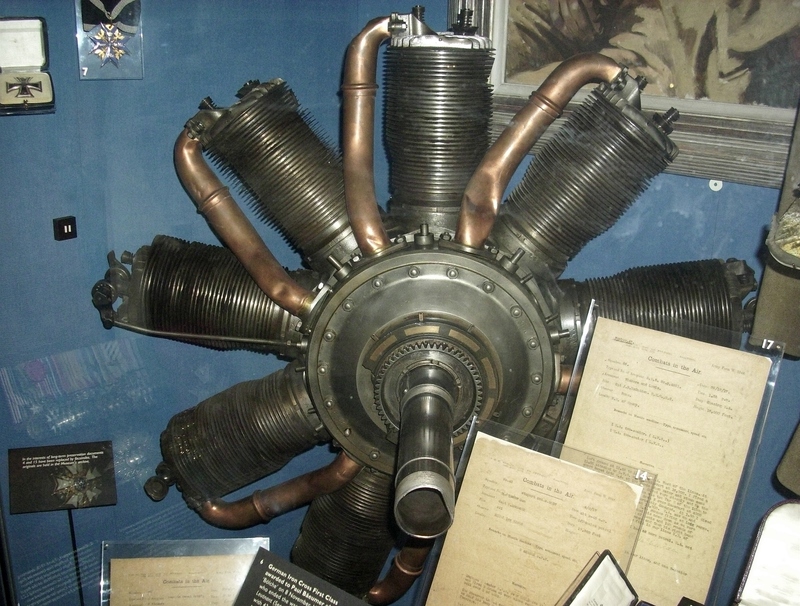 I’ve seen pictures of these in a variety of colours and combinations, but if you look closely at the photo of Richthofen’s engine you can see those were copper with steel flanges brazed on at each end. 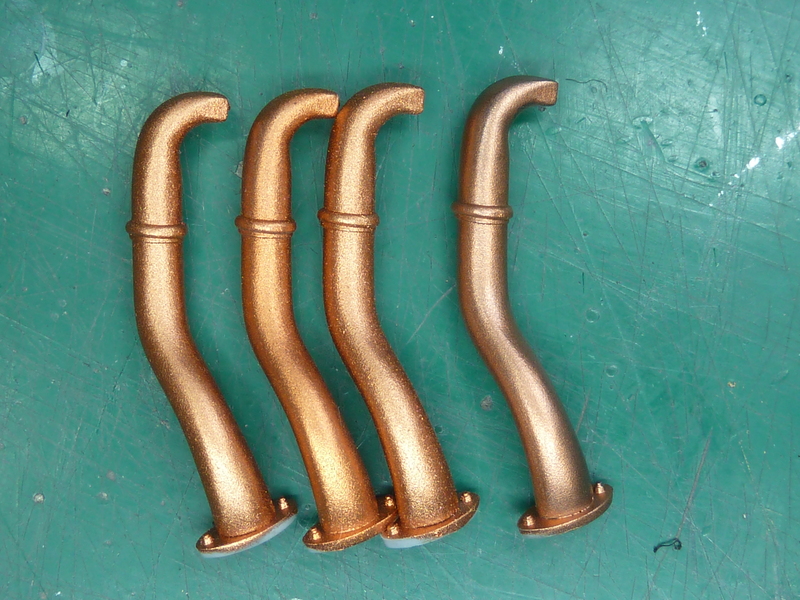 For some reason I haven’t got to the bottom of yet I have real problems spraying copper and brass colours. My airbrush just doesn’t seem to like them, thus the original finish I obtained on the manifolds was less than stellar. I painted them using Humbrol’s copper metallic in the end. In order to improve the finish a little I buffed them up with a toothbrush once the paint had hardened. The 3 on the left in the photo below are as sprayed whilst the one on the right is post buffing. I then hand painted the flanges in yet another shade of metallic grey. Next up were the rocker assemblies on the cylinder heads. The first change I made was to abandoned the brass pushrods in the kit and fit steel ones. They look so much more convincing I think. 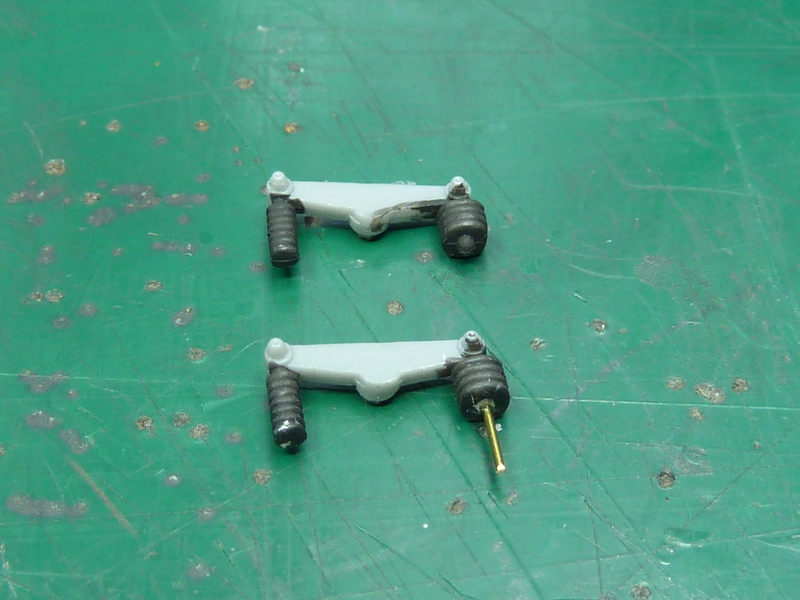 The actual rocker arms supplied in the kit bear little relation to the ones actually fitted on the real engine. So I commenced a programme of modifications, cutting off the spurious securing bolts and drilling lightening holes as per the originals. The final result isn’t a perfect facsimile, but it’s much closer than it was. This time I didn’t bother winding my own valve springs. 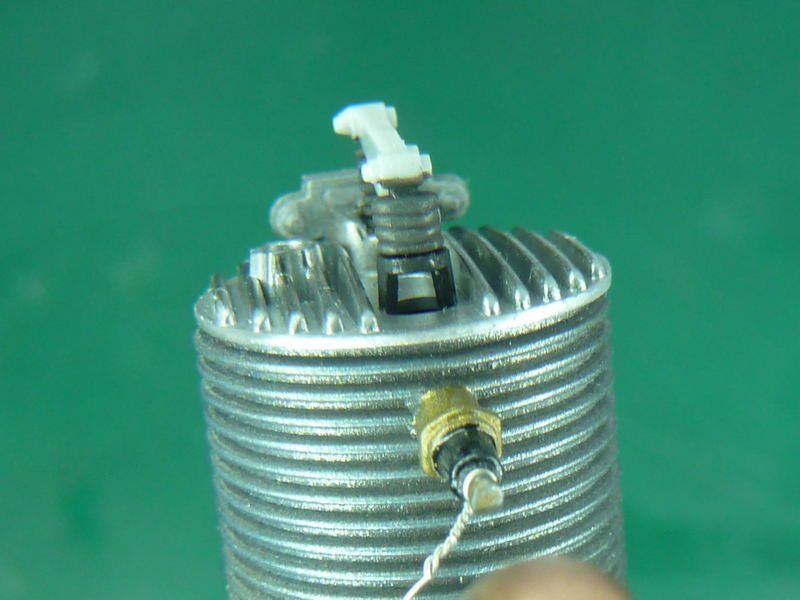 The difference is almost invisible on the Clerget engine I built after installing in the model. I did however add an exhaust valve stem, because it’s missing and easy to include. The changes to the rockers are shown below. 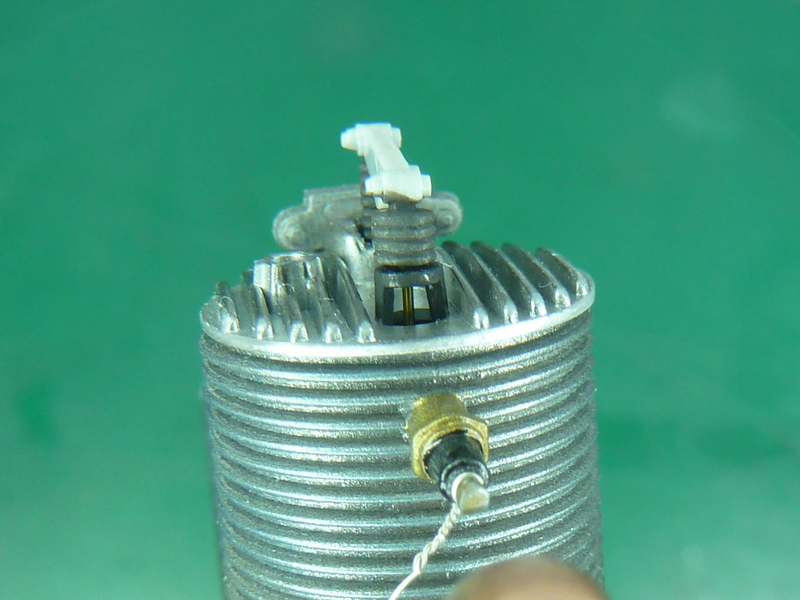 With that done the rest of the engine’s assembly was pretty straightforward, I did however use thin tinned wire in place of the kit’s thicker copper wire for the ignition leads. The completed engine still has large unrepresentative holes in the front and back, but these will be hidden once it’s installed in the model. Outstanding work. It looks like we could start it up!